Sabin de Lasartesse looked up at the nearly full moon as his horse carried him toward his destination. It was a hell of a time of the night for a meeting but this when the tip had said. Kaman was an annoying, wily bard but at least he usually gave out decent jobs. Although, now that Sabin thought about it, the last one had ended badly. He suddenly wondered if he should turn back and look for other work in the morning. At the last moment he decided that if he was this far he might as well keep going and see what Kaman had gotten him into. He began to look and listen for some sign of whoever he was supposed to meet up here. A few minutes later he saw a fire among the trees. Why they were out here in this godforsaken forest instead of a warm inn was beyond Sabin. He was within a few yards of the fire when he felt himself suddenly leave his saddle. For a moment he thought he was floating in the air but soon realized that he was being held there by a massive man clad in animal skins and holding a huge axe in the other hand. His hands free, Sabin drew his twin rapiers and pressed the tips to the behemoth’s neck. “Let me go!” Sabin responded. The stench of the animal skins momentarily made his vision swim. Sabin was stunned. “You!? I was meant to met a stinky barbarian in the woods? I thought this was adventure for fame and profit.” Jorgan laughed again, a sound Sabin was quickly beginning to grow tired of. Sabin sheathed his swords and dusted himself off once he had gotten to his feet. He looked for his horse, fearing in the craziness that she may have run away. However, when he turned around there was a young woman holding onto the horse at the limits of the light of the fire. “If you’ll pardon me, miss, but it seems you’re too young to be about ‘all these years’ ” Sabin watched her curiously. Look for more parts as I figure out the story. Haha. Ok. Bring down the lights. Give me the serious lights, fellas. That’s right. The serious lights. Today is still September 11. Yeah, that infamous day. Here we go. Don’t hate me. On September 11, 2001 I was just days into living in New Brunswick and going to Mason Gross. In fact, it was the day of my first shop orientations. I woke up and dragged my body out of bed and cursed whichever foul creature had created nine o’clock in the morning. If I remember correctly, I met up with the three other production majors in my year at the Neilson Dining Hall. I can’t remember what I ate. Probably lucky charms or scrambled eggs or something. I’m pretty sure I didn’t skip breakfast that morning because I don’t remember eating until much, much later that day. I distinctly remember coming down the path that went past the New Theater (does that have a proper name yet?) and I found myself walking behind a production major a year ahead of me whose name I can’t remember. Natasha something, I think. All I remember is she was the ultimate girly girl and extremely atypical of our subset. I remember being caught downwind of her perfume trail and gagging. I thought she must be an actress with her designer jeans, platinum blonde hair and Pigpen-style perfume cloud. For some reason that image is burned into my mind. Go figure. Moving on, we went into the shops. This is where I truly had my first meetings with Tim Pickens the Technical Director, Emily the Electrician (and a harsh mistress, I’d find) and all the rest of the shop heads. We had to fill out a checklist of shops and topics that each shop head had to cover. It helped get through the monotonous safety stuff. I started to notice the various troublemakers and smartasses who would later be my friends. Funny how I attract those types. Our last stop was the costume shop. I kind of dreaded this because I was never really good at costuming. I mean, I can recognize a good outfit for a character but fashion obviously isn’t my thing. In every other shop we just listened to a lecture but in this shop we actually had to be hands on. We had to thread a sewing machine which, at this point, I had never done. Of course, I was fairly nervous especially since there was a fricking audience. I got it done, though. In retrospect it wasn’t that hard. The thing about the costume shop is that the radio was always on. Always. Everytime I passed it there was some sort of music going on. But, while we were in the costume shop that morning, the music suddenly stopped and the talking started. Slowly the crowd was drawn in by the words on the radio. Some sort of attack on the World Trade Center. Chris Klinger aka Superman (to his friends) was suddenly a mess. We were all shocked but he was frantic. Meredith was able to get out of him that his father worked at the World Trade Center. We didn’t know what to say or at least I didn’t. Shop orientations were obviously closed and I heard that people were gathering in the New Theater. This was the first time I saw Rudy Veltre in action. The old roadie wheeled a tv in front of the stage and began to search for a television station, any station, that would tell us what was happening. The only station still coming in was Univision and although I know Spanish, none of it was registering. Rudy turned down the sound and found a radio station that was coming from near Manhattan. So we watched Univision as we listened to radio updates. Eventually, we couldn’t stand to be in that theater so we walked outside. Chris was dragging along with us, barely there. We got to Voorhees Residence Hall (oh sure, put a bunch of teens in a dorm with *that* name). I didn’t live there but Chris and Brian did, I think. The whole lobby was watching the news on tv and we saw that the second tower had fallen now. People were talking bombs but the news pretty much put that to rest quickly. Chris came in from outside and excitedly told us that his father had been late for work that day. He lived. Eventually, I had to get out of there. I felt numb. I found my way back to my dorm room and I switched on the tv. I watched a few minutes of news and then I thought better of it and switched over to Cartoon Network. I sat there and I watched cartoons instead. From that moment on I told myself I would try not to see the images of the towers falling again. And it worked, I didn’t feel as sad as the people next to me. And that’s just it. I didn’t even realize September 11 had come up again. Yesterday, I heard some guy on NPR talking about how he still feels a deep-seated need for vengeance. As he spoke of this he started to cry. I felt sorry for the guy. I felt sorry for him because he was clinging to death. Call me a robot, call me insensitive, call me what you will but my philosophy is Never Forget… but for your own sake move on. You can’t cling to the dead like that. I find it morbid and pointless. If anything, think of the good times. It’s all about going from good time to good time. Make them last, don’t dwell on the sad times. Just one guy’s opinion. Thanks. 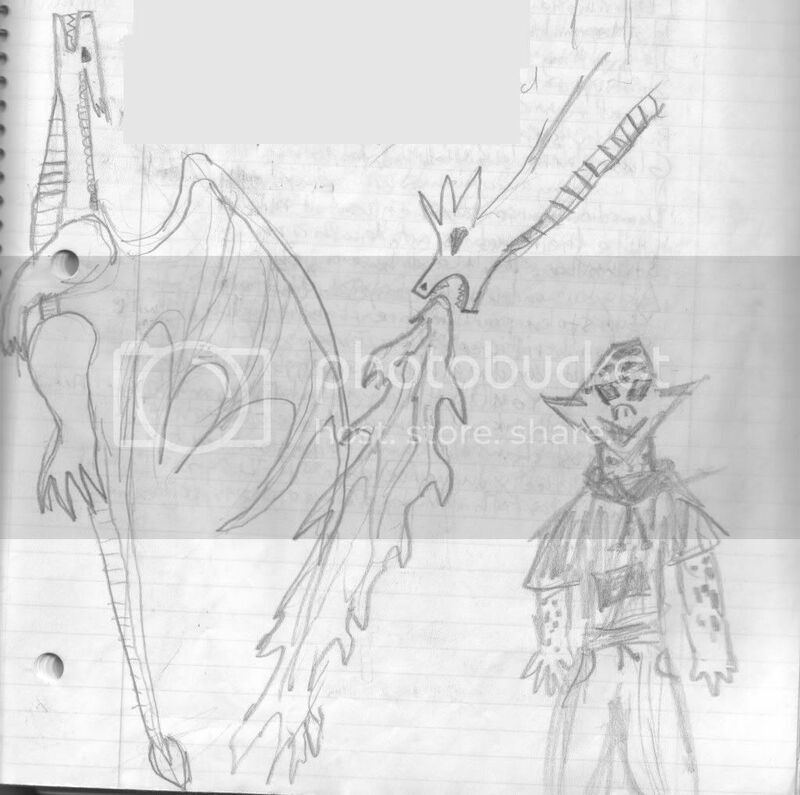 During lectures in college was an excellent time to doodle. 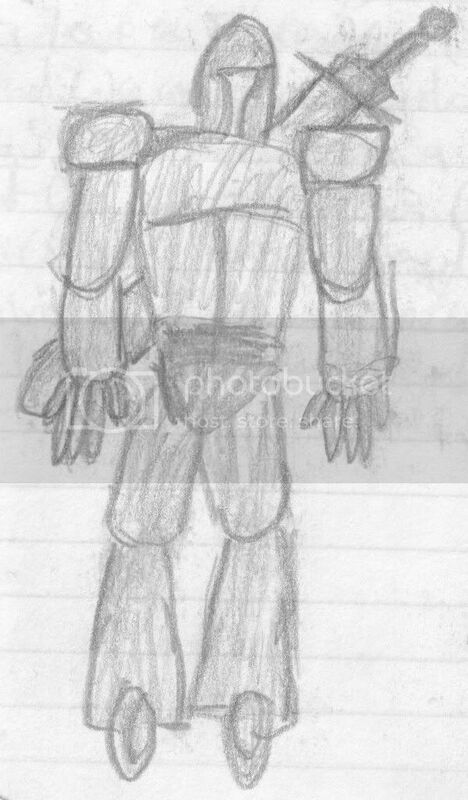 While I waited for class to start or the professor to get to the point, I would often start drawing. Here’s some of that. I’ll probably post more.